Make Up For Ever has been on a serious roll the past year with their new launches. Everything I have tried out, I have loved - and their products are always so innovative. For e.g. their Pro Bronze Fusion Bronzer - it's almost a gel-like texture, but it's hard. It's sheer, buildable and gives you a wonderful glow without the cakiness or powder build up. Therefore, this time when they released their Pro Sculpting Collection, I knew I had to give it a go and get my hands on it ASAP. Here's a closer look at the palette itself. It is a cream based formula and comes in four tones - hilight, contour, shimmer and color. 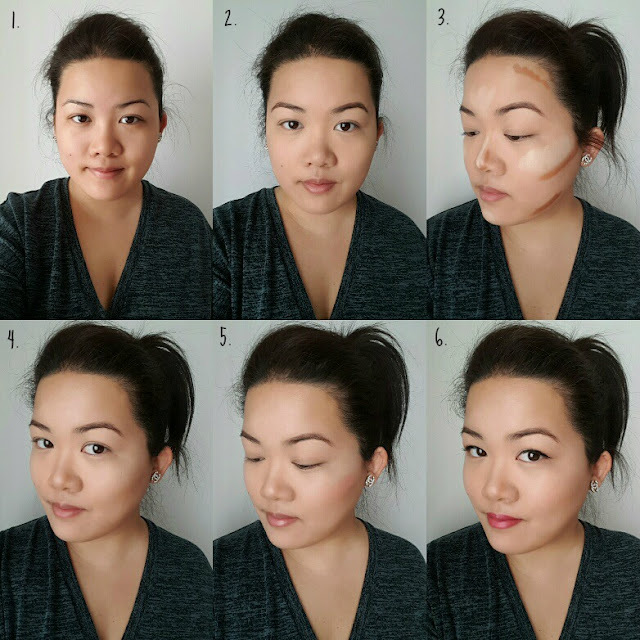 The creams blend beautifully and effortlessly on the skin, and the contour shade doesn't cast an orange shadow on you (so there is no oompa-loompa vibes here at all). While they look super concentrated in the palette, they do blend out very well and look very natural on your skin. 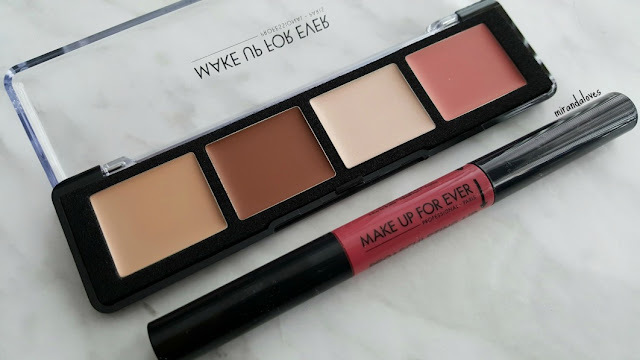 I found the best application to use a synthetic fiber brush to apply the product to your skin, and then use a make-up sponge to blend out the product for a seamless look. The palette comes packaged with a fold-out pamphlet that teaches the user how to use the palette which can best compliment their own face shape. As I am a mix of oval and round - I decided to use a combination of those two to create my demo below. 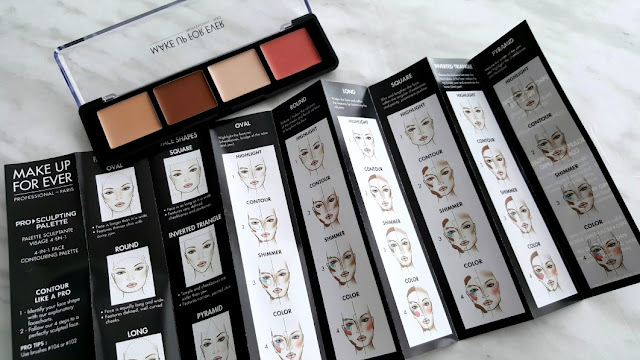 It is also important to note that the Color section of the palette, actually acts as a blush color, vs. an under-eye corrector. 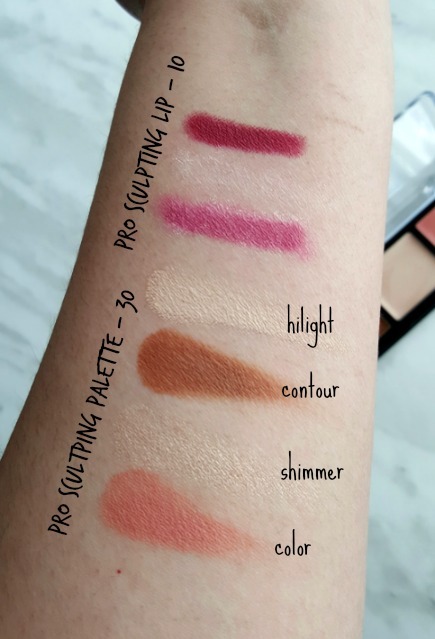 Attached here are swatches of the pro sculpting face palette in 30 ($54 cad) and pro sculpting lip in 10. Below is my demo of the sculpting palette in use - please note that I am opting to create a more natural contour here as that would be my everyday use - vs. a dramatic chiseled cheek look most beauty gurus go for these days in social media. 4. Blended out with the RT Makeup Sponge - instant cheekbones! 5. Shimmer and Color added to the cheeks. 6. Blended out again with the makeup sponge and the pro lip sculpting (10) applied for the final touch (a nice pouty lip). 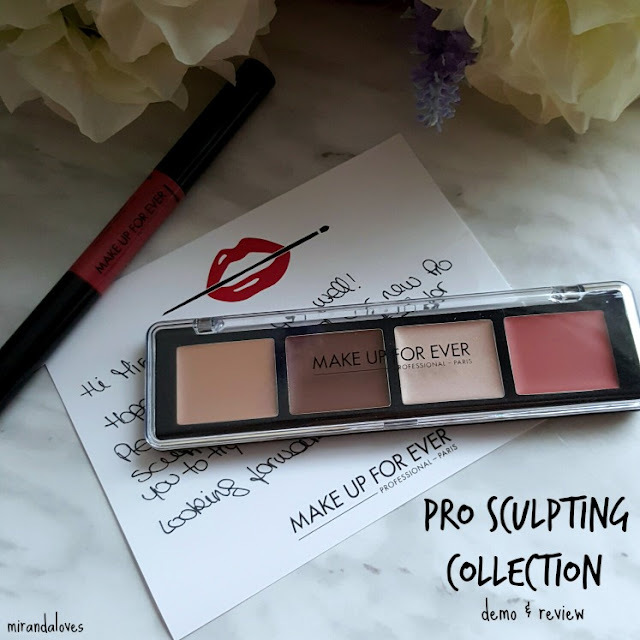 I highly recommend purchasing the Pro Sculpting Face Palette as it is a versatile and complete, yet sleek palette that provides you with all your sculpting needs! Even someone like me, who rarely contours because I don't want it to look overly dramatic, found this palette a good balance and simple enough to use to be incorporated into my daily routine.